Really I'm just testing out my moblog ability (sending txt and pictures directly to the blog from my cell phone). 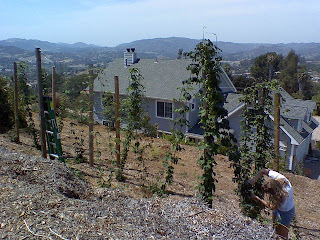 I have several pictures of my hop farm on my phone. This was taken during the harvest in July of 2007. Blogger makes it very easy to send txt, pic, and video messages directly to a blog. With a pic message, I can still send 1000 characters. Now, I'll be able to blog from beer events anywhere! Here's a mobile cheers to ya.